This morning when I lazily got up at 8:30 a.m., I looked out my kitchen window and lo and behold is a barred owl sitting on top of the post where the bird feeder is attached. Carol Pershyn blames barred owl for scooping up ‘Fatso’ and friends. Totally majestic. I love watching wildlife. Yesterday I noticed a total absence of three of the four red squirrels that frequent this feeder, besides the nuthatches, chickadees and woodpeckers. I wondered if the red fox had gotten himself a squirrel meal. I had threatened “Fatso” — the most aggressive of the four — that I would make a meal out of him if worse came to worse. Fatso would never let up, always arguing with his fellow squirrels and mostly chasing them away. As time went on he just increased his girth in the mid section compared to the other three. I was not fond of this fellow as I do not like greed, and occasionally I would throw a snowball at him to tone down his nasty behaviour. He would be OK for a while but then would start up again. A week ago, I noticed squirrel prints going under the tarp I cover my sawhorse with where I chainsaw wood for the winter. Then I took some pine needles and leaves that were stored in the metal shed and meant for the transfer station in the spring and put them under the wooden horse and created a club house for the squirrels. Some squirrel, or more than one, was making use of this shelter, besides the little snow caves they would dig out as wind shelters for themselves. 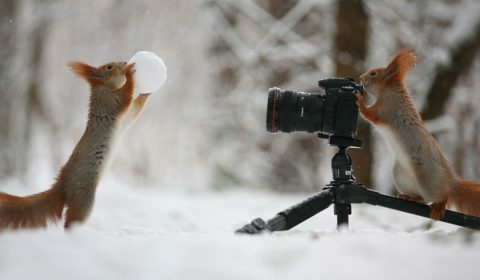 Red squirrels love to play around, in this cute internet photo by Vadim Trunov in Russia. Now, not one squirrel is left. Circumstantial evidence points to the last squirrel being scooped up this a.m. after the snowstorm, because there is a nine-foot distance between a tree the squirrels would scoot up and the post that has the feeder on it. Squirrel tracks went from the tree about five feet over to the post and then they simply disappeared. Scooped up by the barred owl no less. My National Geographic Society Field Guide to the Birds of North America has a few facts relating to the barred owl: “A chunky owl with dark eyes, dark barring on upper breast, dark streaking below. This morning’s owl did not make a noise because he was hunting. When I went outside to shovel snow he was still around, but had moved to an adjoining tree. Well, red squirrels, I will miss your antics. Hopefully some new ones will take your place. And good luck to the barred owl in his continuous hunting.